Welcome to the Honda CBR300R review. The CBR300R is the latest Learner and commuter class motorcycle to hit the world wide market and the latest from Honda in a seemingly very competitive class. It is based on the slightly older CBR250R which has been a relative hit in some markets. (There is also a 400cc version for the Japanese market.) The CBR300R retail pricing was announced at $5699 + on road costs so should be around $6500 in most Australian States and Territories. In terms of engine specifications the CBR300R compares well to the Ninja 300 which was released earlier this year. Honda claims that they have tried to reduce fuel consumption to a claimed 3 litres per 100 kilometers which is a litre of so less than some other motorcycles in the same class. Since motorcycles use very little petrol for the distinct performance advantage compared to cars it will be interesting how the rest of the Honda range will develop. 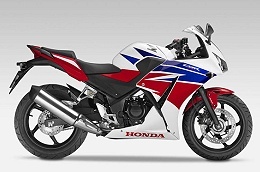 However it is the CBR300R’s redesigned fairing to match the equally new CBR500 which sets it distinctly apart. It looks good although conservative next to the Kawasaki Ninja 300 and no where near as nice as the 2014 RS series from KTM. (Check out my Instagram for pictures) Update: That said in real life the CBR300R does look better in real life than it does in pictures – so recommended to view see it on the road before deciding. I had to add this update because I saw a CBR300R side by side with the Ninja 300 and my first impression was how old the Ninja looked! In the end the Honda CBR300R is a motorcycle that again has the potential to be a great seller if the price is right and it will undercut the competition for sure. (And it is!) I wished that the fairing design could have been a little more adventurous especially with the latest Ninja 300 and the 2014 KTM models to choose from.